Natural sky light reveals cavern's formations. 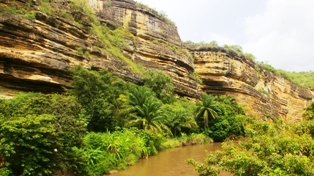 The Angola Field Group invites you to explore two caves in Kwanza Sul, outside the city of Sumbe. We will depart Saturday June 4th at 6:00 AM from our meeting point, to be announced. It’s an approximate 4 hour drive from Luanda to Sumbe. After checking into our hotel on the marginal of Sumbe, we will visit the first cave. There is a descent so good running shoes or hiking boots advisable; also there is a thick layer of fine dust on the floors of the caves. There should be time on Saturday to also see the Cubal River Gorge and the near-by forteleza. 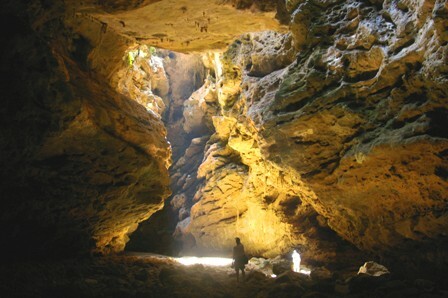 Sunday we will get an early start back to Luanda and visit the second cave enroute. We hope to be back in Luanda by late afternoon. We will spend Saturday night in the Sol Nacional Hotel, a comfortable colonial era building overlooking the ocean. Ocean-facing rooms are 200usd. No view is 180usd. Price includes breakfast. Saturday evening dinner will be in a restaurant on the marginal. You will need to pack lunch for both Saturday and Sunday. * * *All Angola Field Group trips are at your own risk. We will be traveling through 3 provinces so you must have original passport with valid visa with you. An email with final times and departure point will be emailed to confirmed participants. We need to limit the number of cars so sign up as soon as possible but only if you seriously intend to go. This field trip is being organized and led by Kelse Alexander and Tako Koning. Gorge created as Cubal River cuts through coastal plain.